Saturday July 15, 2017: Today we started up the Champlain Canal. 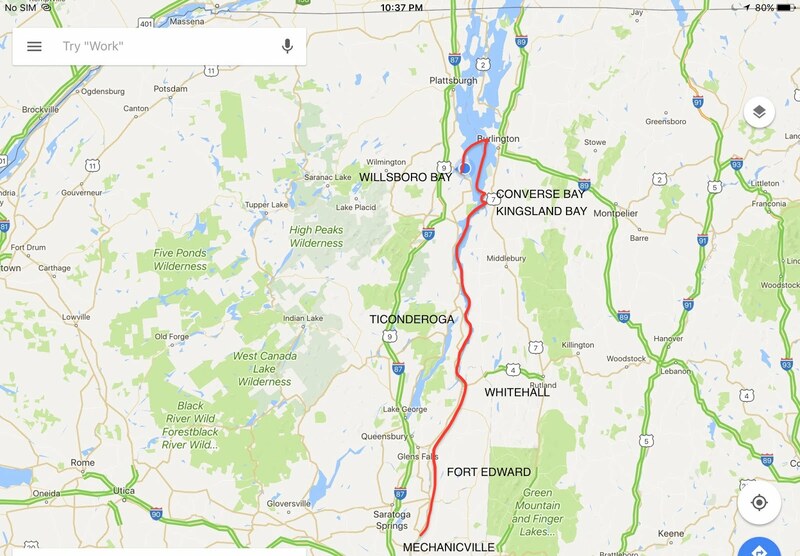 This is the 55 nautical mile route that will take us from the Hudson River to Lake Champlain. Technically, we are still in the navigable section of the Hudson River for a further 31 nautical miles. 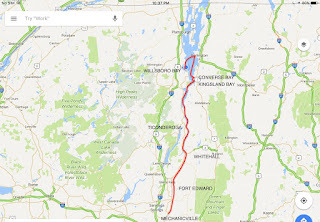 But this section of the river, plus the approximately 24 nautical miles of man made canal and 11 locks, make up what is known as the Champlain Canal. There is still some commercial traffic on the river, mostly barges being pushed by hefty tugs. Today we made it from Mechanicville to Fort Edward, which was named after a British fort. Fort Edward was located at the “Great Carrying Place”, a portage around the water falls on the Hudson, used by Native Americans for thousands of years before European colonization. During the French / Indian wars, British General Pineas Lyman constructed a fort at this location in 1755 and it was later named Fort Edward after the grandson of King George II. Shortly after we arrived, the Fort Edward Yacht Basin wall gradually filled up. We are starting to see more Canadian boats on the system, all from Quebec. Once again we were treated to free docking, hydro and water. How wonderful. While we stayed on Tug’n for dinner, Bob and Jan headed off to the Anvil Inn to celebrate their 20th wedding anniversary. They reported they had an outstanding meal at this location, which was originally a blacksmith shop build in the mid 1700’s. Sunday July 16, 2017: The Champlain Canal was originally built from 1817 to 1823. It had 23 locks, a limiting depth of 5 feet and an overhead limit of 11 feet. The canal was rebuilt several times over the following 100 years. Some remnants of the original canal are visible in Fort Edward and we took a walk to see one section of this much smaller canal (see above pic). 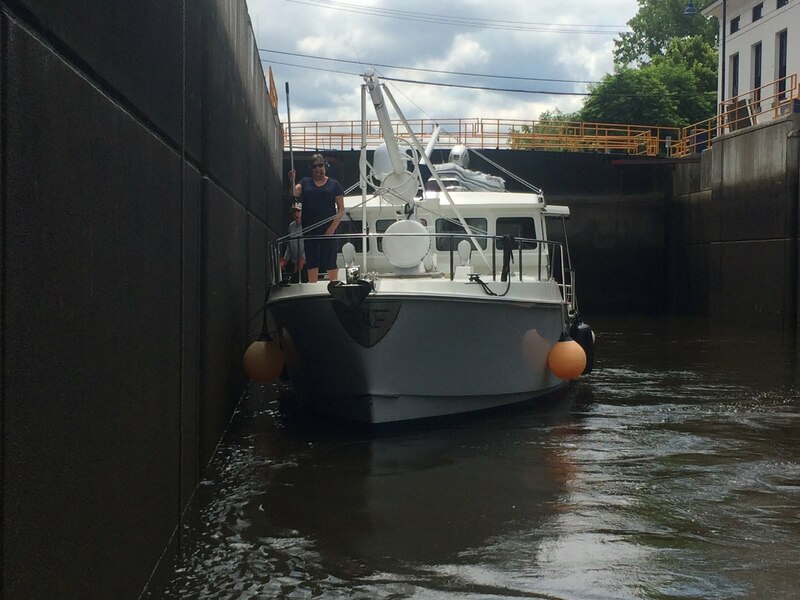 Boats on the original canal were 70 to 80 feet long and carried up to 150 tons of cargo. They were pulled by mules or horses on a path along side the canal. Our objective today was to reach Whitehall and tie up on the Champlain Lake side of the canal to re-erect the mast on Bob and Jan’s boat Wings. The locks were well coordinated and we made good time. We saw one barge and two tugs plus about 10 pleasure craft today, the most in one day since we passed through New York. We passed Dave and Judy aboard “Katherine” and enjoyed a few minutes of chatting on the radio and across our bows as well as a blast of our horns. 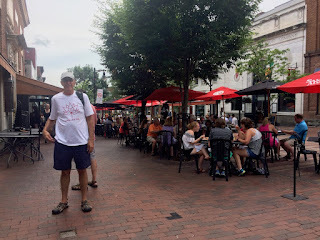 They’d had their visit in Whitehall and were now making their way back to Mystic, Connecticut. It was a very hot day on the canal and by the time we passed through lock #12, we were ready for a break and refreshment. 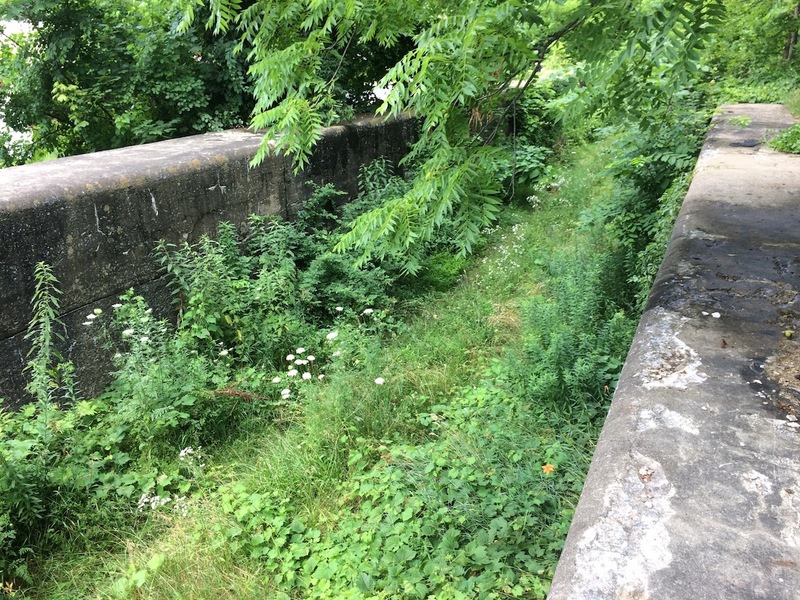 As we looked around, the public tie up wall no longer existed. There was a modest looking marina there in its place and with no breeze, it did not look very inviting. So, after a quick radio conference with Wings, we decided to head on further to an anchorage near Fort Ticonderoga, a further 14 nautical miles. It was a very pleasant cruise down the relatively narrow southern end of Lake Champlain. As it gradually widened to about 1/2 a mile, the fort came into view and we anchored just to the south of it. The water had cleared up tremendously from the sediment colour of the Hudson River and Champlain Canal and our first order of business was taking a swim. It is hard to put into words the sheer joy of being able to dive into aqua green fresh water off the stern of your boat on a sweltering hot day. While cooling off, I took a brush and gave the water line a light scrub to remove the leftover markings from the river and canal. Wonderful, just wonderful. Some ice cold white wine followed by a BBQ’d dinner and another swim finished off a great day. While we missed out on exploring Whitehall, we had a great consolation prize. Monday July 17, 2017: After breakfast, we rafted up with Wings and helped Bob and Jan re-erect their mast. Afterwards, we had a leisurely cruise northward on Lake Champlain. The lower section of Lake Champlain is really quite narrow, but the rolling, tree covered hills on both sides makes it look very scenic and attractive. We were making use of a cruising guide given to us by Bob and Jan, which had rated anchorages in terms of their protection from weather and scenic appeal. From it, we’d chosen Cole Bay as our destination, about a 19 nautical mile run under beautiful sunshine, calm water and hot summer temperatures. As we approached our anchorage, ominous dark clouds were rapidly approaching. I checked the weather radar on my iPhone and determined the rain and thunderstorm would start just minutes after we’d anchored, so we hustled right in and anchored quickly. Right on cue, the thunderstorm started, the temperature plummeted and the rain started. Rain, lightning and thunder continued for more than three hours and it took a few more hours for the sky to finally clear up and the sun to re-emerge. In the evening, the wind picked up from the south and was quite a bit stronger than forecast, resulting in a rather bouncy night at anchor, but we seem to be getting used to the sound of wave slap on the hull. Tuesday July 18, 2017: Another beautiful summer day emerged with the sun rise. We are mostly getting up by 0600, energized by the bright sunshine through our port holes. We were underway by 0900 for one of the next highly recommended anchorages called Kingsland Bay, a relatively short run of only 9 nautical miles. It was a beautiful spot with a state park on one side, one particularly lovely home / property and a small beach on another side. The hilly shoreline was blanketed with lovely forest. After anchoring, I began the long overdue chore of cleaning the dinghy and applying a protective coating on the inflatable tubes to protect them from the UV. After lunch, we took a dinghy ride to a nearby marina to buy a bag of ice and see what else they had in their “Ships Store”. Skimming across the water at 16 MPH, feeling the wind rush through your hair on a hot summers day - what a joy. The wind died in the afternoon and the temperature rose. We were in the water for a dip every hour or so to cool down. We really have been blessed with magnificent summer weather for about four weeks now. Lake Champlain is a unique body of water. It is part of the Champlain Valley, which is part of a larger landform known as the Great Appalachian Valley which stretches from Quebec in the north to Alabama in the south. The lake drains north, through the Richelieu River to the St Lawrence Seaway. The region’s original Native inhabitants used the lake as a means of transportation. Early European explorers used it as a route into the new continent. It was of course named after explorer Samuel de Champlain who discovered it in 1609. Many naval battles were fought on the lake in its colonial period. Vermont, New York and Quebec share the shoreline of this 490 square mile lake with a shoreline of over 500 miles and a length of 125 miles. There are over 70 islands on the lake, ranging from 13 miles long to some as small as oversized rocks. The water is clear and deep with many areas having depths of 200 feet or more and one area has a charted depth of 399 feet. The west shoreline is dominated by the Adirondack Mountains (New York side) and if one uses imagination, you could easily think you were cruising the west coast of Canada. The shoreline has seen little development and has many fine anchorages for the gunk holing boater. In fact, the scenic shoreline and wonderful anchorages result in this being just about one of the finest cruising areas we’ve seen. Wednesday July 19, 2017: A new summer day, a new anchorage! We only moved 3 nautical miles and found ourselves in another lovely, all-weather anchorage called Converse Bay. This good sized anchorage had a lovely wooded shoreline, plus several islands providing protection and great scenery. The morning was devoted to some more chores, the primary one being the anchor locker. Our anchor chain had spent a lot of time in salt water and it looked and felt rather cruddy. So, after we were well anchored, I let out all 175 feet of chain so it could soak and rinse off in the fresh water while I gave the anchor locker a good scrub and rinse. Later, I used Bartender’s Friend (a stainless steel cleaner) to spot clean a small number of areas where the salt water had caused some minor rust stains. Afterwards, I polished the shiny stainless with a marine stainless steel polish. The day was getting good and hot again, so the rest of the time was spent relaxing, reading, taking regular dips in the lake and watching other boats come and go from the anchorage. 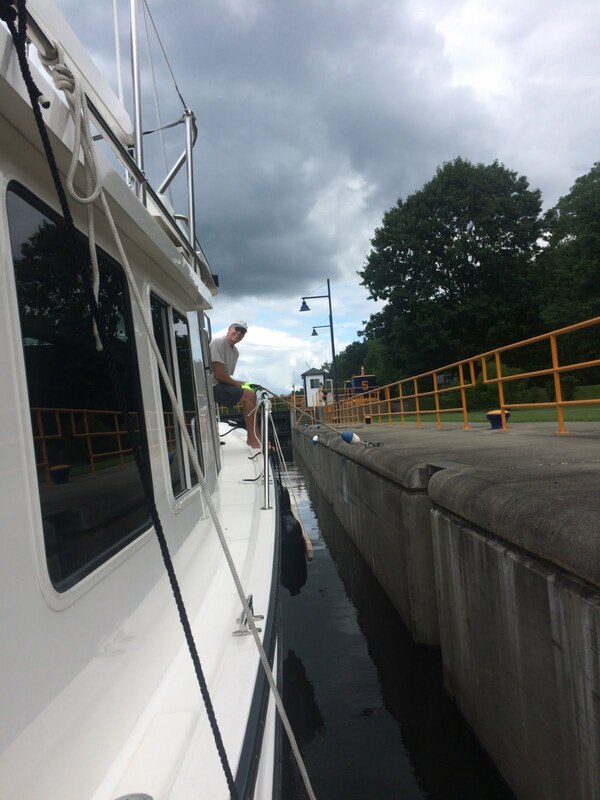 Bob and Jan from Wings had spent the previous day and overnight in the nearby town of Vergennes and joined us in Converse Bay this afternoon. At one particularly hot point in the day, Fran and I swam some 500 feet over to their boat for a visit and some exercise - and then back to Tug’n. Thursday July 20, 2017: Today, we backtracked a short distance to fuel up at Point Bay Marina, who offered a particularly good price on diesel, before we headed off to Burlington, Vermont. Burlington is the largest city in Vermont with a population of a little over 42,000. It is home to the University of Vermont, Champlain College and Vermont’s largest hospital, the UVM Medical Centre. 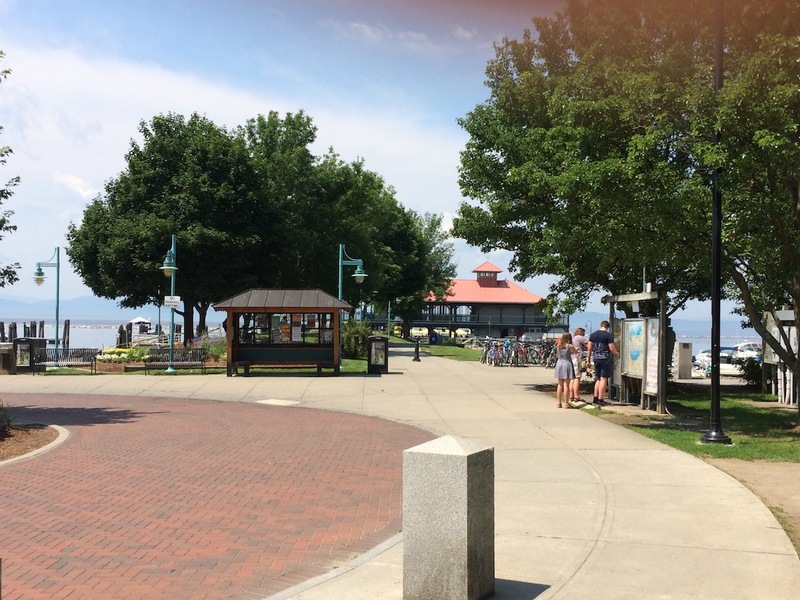 In 2015, Burlington become the first city in the US to run completely on renewable energy. The town’s position on the east shore of Lake Champlain helped it develop into a port of entry and centre for trade, particularly after completion of the Champlain Canal in 1823, the Erie Canal in 1825 and the Chambly Canal 1843. Burlington became a bustling lumbering and manufacturing centre. In 1978, the ice cream enterprise Ben & Jerry’s was founded in Burlington in a renovated gas station and it went on to become a national brand (and one of our favourites). Due to the summer heat and the wonderful cruising area we were in, our stay in Burlington was brief. We spent three hours there, going for lunch at Gaku Ramen to address a need for Asian food, followed by grocery shopping. Then we were off to another anchorage named Willsboro Bay. It is a unique, fjord-like body of water whose western shore has very deep water, matched by very high, rugged cliffs. The southeast end of the bay is almost the only area one can anchor due to its shallower water. It offers a stunning view of the western shoreline and mountains and that alone was reason enough to visit and anchor there for the night. We swam, enjoyed happy hour in the cockpit, followed by a southwest chicken salad for dinner (one of my favourite meals on a hot summer day. The end of another great day that puts a smile on your face when you fall asleep. I appreciate the way you combine the joys of boating with honest descriptions of all the work undertaken to keep the boat in good nick. Lovely photos.